How to use MDX query result in dashboard through Data Integration Platform (DIP)? 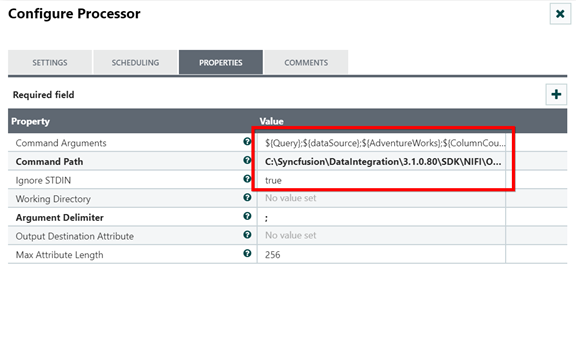 Syncfusion Dashboard Designer does not support executing the Multi-Dimensional Expressions (MDX) query against a Microsoft SQL Server Analysis Services (SSAS) cube. This functionality can be achieved in the Syncfusion Dashboard platform via Syncfusion Data Integration Platform (DIP server). The Syncfusion DIP server provides an intuitive visual interface for integrating and transforming data from various sources into analytics-ready data. The transformed data can be easily used in the Syncfusion Dashboard Platform to design the dashboard. 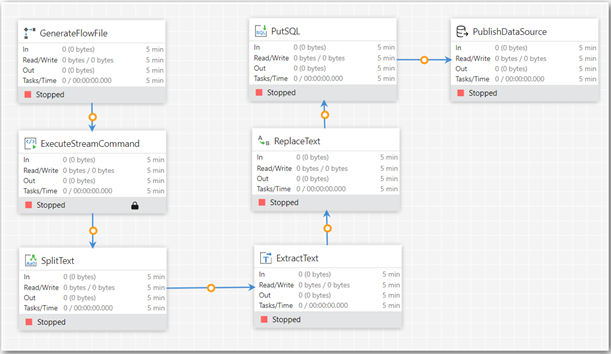 Move the resultant data of corresponding MDX query from an OLAP Cube (SSAS) to target SQL server using the custom processor through the Syncfusion Data Integration Platform. 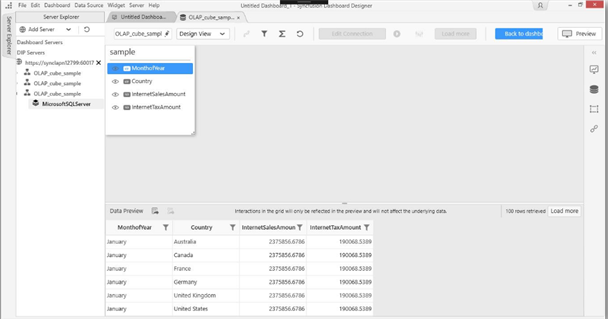 Use the published data source via DIP server in the Dashboard Designer. The following are the list of processors required to setup the DIP. Generates an empty FlowFile content. Executes an external application and creates a new FlowFile with the results of the application. Splits a text file into multiple smaller text FlowFiles. 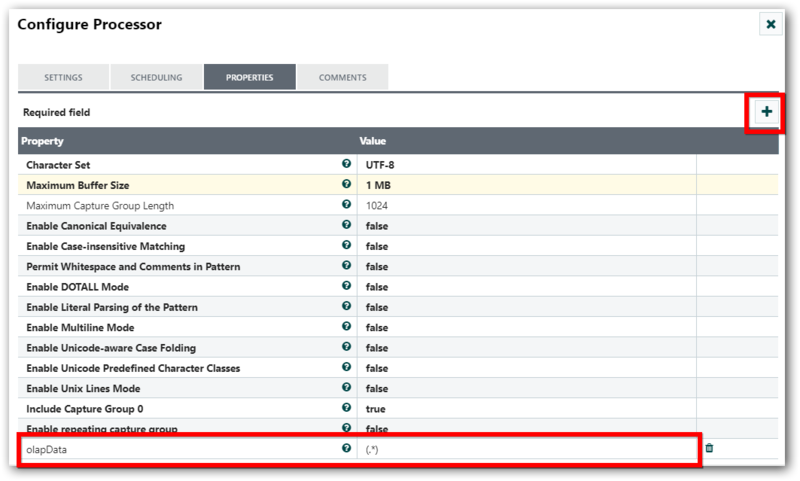 Evaluates one or more Regular Expressions against the content of the FlowFile and the results of those expressions are assigned to FlowFile attributes. Replaces an incoming FlowFile with given content. Executes SQL update or insert command. Publishes the process group connection details into the Syncfusion Dashboard Designer. Step 1: Drag and drop the GenerateFlowFile processor into the work area. Double-click this processor and choose the SETTINGS tab in the Configure Processor dialog, and then rename the processor name in the Name field. Now, choose the SCHEDULING tab and change the Run Schedule field as per your need. For example: 1 day, 1 hr, 5 mins, and 30 secs. In properties, add new properties using the Add icon. ColumnsCount: Number of columns to be returned. 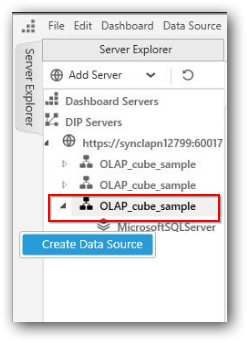 dataSource: OLAP Cube data source IP. Query: MDX query (Here, users need to give the MDX query). 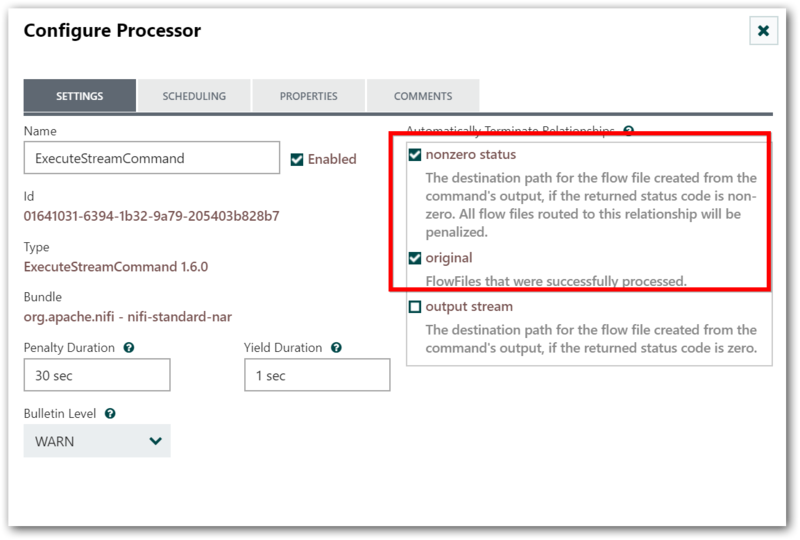 Step 2: Drag the ExecuteStreamCommand processor to work area and connect the GenerateFlowFile processor to ExecuteStreamCommand processor with Success relationship. 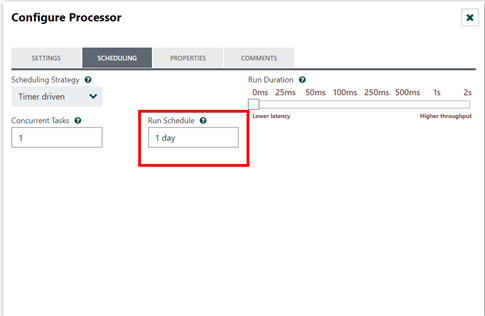 Double-click this processor and choose PROPERTIES tab in the Configure Processor dialog. In properties tab, enter the value for command arguments, command path, and ignore STDIN properties as follows. Note: If you need to ignore the failure case, select the auto-terminate option for corresponding relationships as follows. Step 3: Drag the SplitText processor to work area and connect the ExecuteStreamCount processor to SplitText processor with Output Stream relationship. Double-click this processor and choose PROPERTIES tab in the Configure Processor dialog. Enter 1 as a value for the Line Split Count property as shown in the following screenshot. It splits each incoming FlowFile line into separate FlowFiles. Step 4: Drag the ExtractText processor to work area and connect the SplitText processor to ExtractText processor with Splits relationship. Double-click this processor and choose PROPERTIES tab in the Configure Processor dialog. Add a new property as olapData using the Add icon as follows. 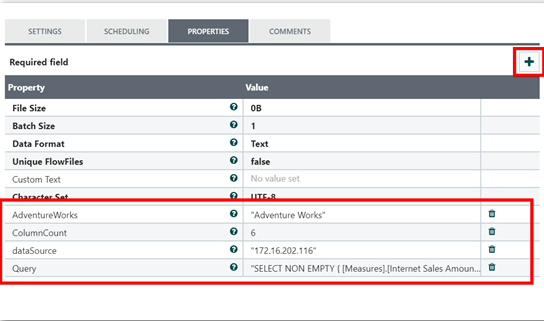 The newly added property will get the FlowFile data and update the value to the olapData attribute. Step 5: Drag the ReplaceText processor to the work area and connect the ExtractText processor to ReplaceText processor with Matched relationship. Double-click this processor and choose PROPERTIES tab in the Configure Processor dialog, and then enter the SQL query in the Replacement Value property. Refer to the query used in the above screenshot. 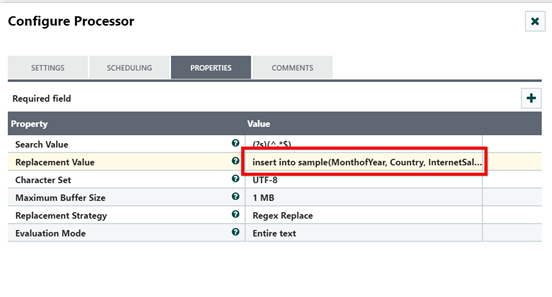 Important note: Here, the insert query is written with column names as per the result obtained from the sample query used in Step 1. You can customize it based on your use case. Step 6: Drag the PutSQL processor to work area and connect the UpdateAttribute processor to PutSQL processor with Success relationship. Double-click this processor and choose PROPERTIES tab in the Configure Processor dialog, and then enter the values for JDBC Connection pool property as follows. Note: To configure the MicrosoftSQLServer controller service, refer to the following help link. Step 7: Drag the PublishDataSource processor to work area and connect the PutSQL processor to PublishDataSource processor with Success relationship. 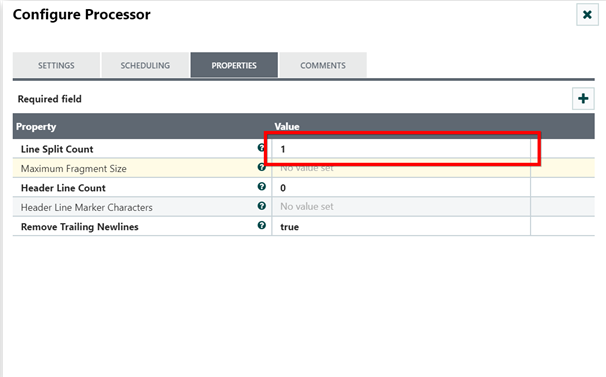 Choose PROPERTIES tab in the Configure Processor dialog, and then enter the values for required properties as follows. Step 8: Now, start the workflow. The OLAP data will be moved into the target SQL server. 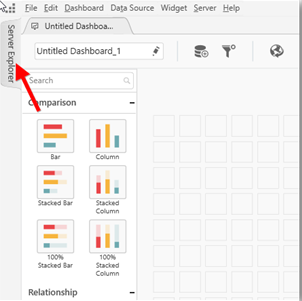 After publishing the data source using the DIP server, you can use that data source in the Syncfusion Dashboard Designer using the Server Explorer option. 1. Expand the Server Explorer tab in left corner of the Dashboard Designer. 2. 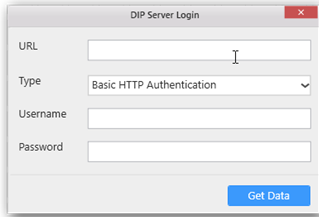 Right-click the DIP Servers and select Add Server option to open the DIP Server login window. 3. 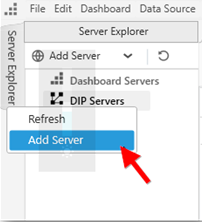 Provide DIP Server details in the window and click Get Data. 4. Expand the published workflow and click Create Data Source option by right-clicking the target server. The data source is added in the data design view as follows. Now, user can continue to design their dashboard with the available data source. Note: When using Data Integration Platform, data is stored into the target SQL Server. Hence, you can also directly connect the data source using the target SQL server details via the New Connection window. Refer to the following files from the given downloadable link.